Bread, in all its forms, excites me. My husband had no appreciation for bread when we met. His exposure to bread was limited to white sliced sandwich bread. Initially he humoured me as I dragged him around bakeries. I’d buy loaves of crusty bread and break off chunks to snack on as we walked. He thought I was weird. Over time he accepted the little chunks I offered. Slowly, he developed a taste and appreciation for bread. Today I can proudly report he even has a favourite crusty bread, sourdough. Our children are all bread lovers. Our local bakery is very much a part of their lives. On weekdays, we walk up to the bakery for coffee, bread and cheese & bacon rolls. On weekends, the kids in the neighbourhood make their way there for lunch after running around all morning. They pull up some crates at the front of the shop and plan the rest of the day over some meat pies and sausage rolls. So this week’s Tuesdays with Dorie: Baking with Julia recipe had me excited! And, if I’m to be honest, a little apprehensive. Eating bread is one thing. My expectations were low, so to see the golden, crispy focaccia come together was incredibly satisfying! I halved the recipe and then divided the dough I had, into two equal balls. The first one I topped with olive oil, salt and a sprinkling of thyme and rosemary. 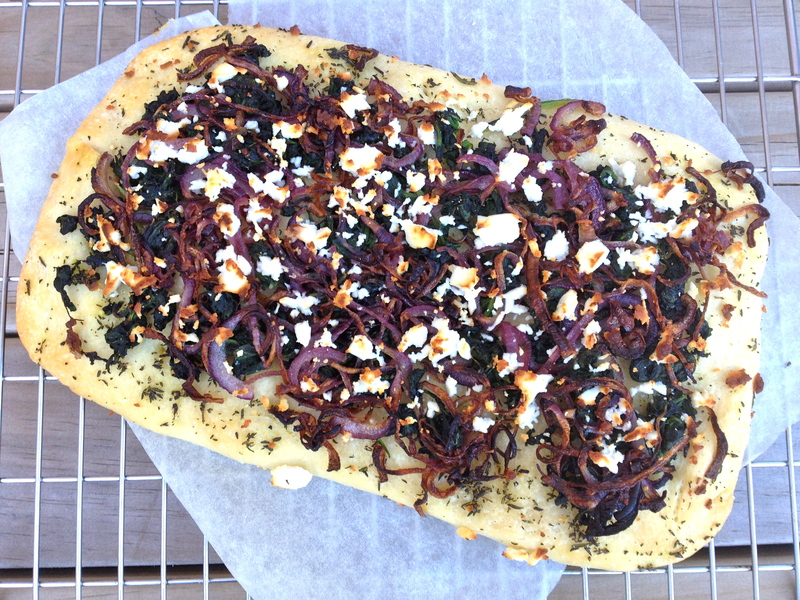 I found a recipe for Cheesy Focaccia with Caramelised Onions and Sauteed Spinach in my copy of Baked: Elements. 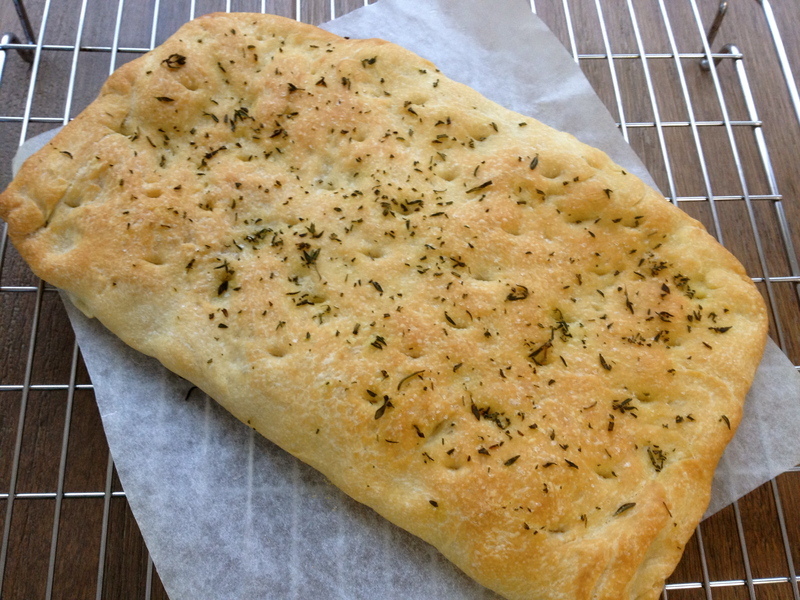 The plain focaccia was crisp and crusty. The second one however was softer, the topping gave it a moistness that made it delicious warm and cold. The recipe for the topping follows..
1. Heat 1 tablespoon of the oil in a pan over medium-low heat, add the onion and saute until soft and translucent. Set the onion aside when finished. 2. Add the spinach to the pan and cook until spinach is soft. Set aside to cool and squeeze the spinach dry when cool enough to handle. 3. 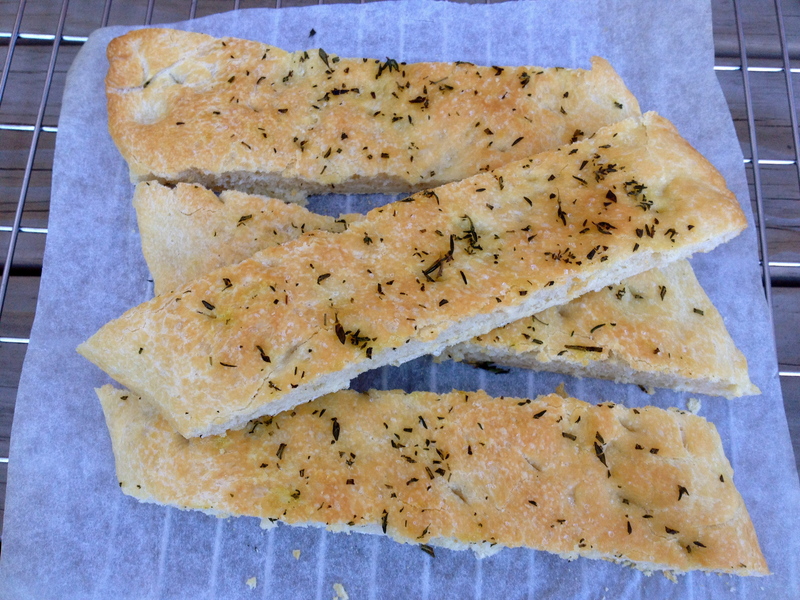 When the focaccia is almost cooked (about 15 minutes), pull out of oven and brush with remaining olive oil. 4. Sprinkle with chopped herbs and salt. 5. Top with onion, spinach and crumble goat’s feta cheese. 6. Place focaccia back in oven and continue baking until the cheese starts to brown. Tags: baking, bread, cooking, focaccia, food, recipes, Tuesdays with Dorie | Permalink. 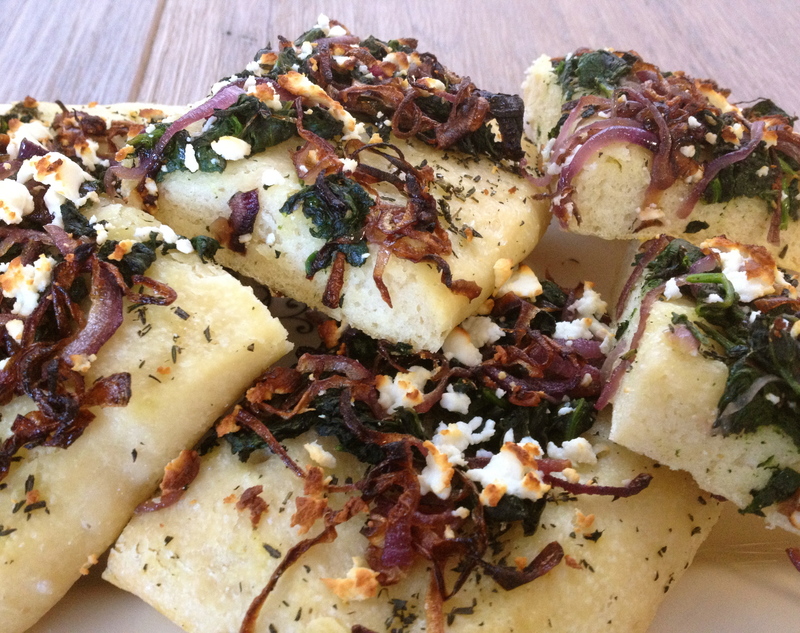 I wanted to make the BAKED Elements focaccia this weekend, but just didn’t get to it. Great idea to use their toppings with the second ball of dough. Both versions look wonderful. That looks absolutely delicious! Thanks for baking along – glad you enjoyed it. Awesome! 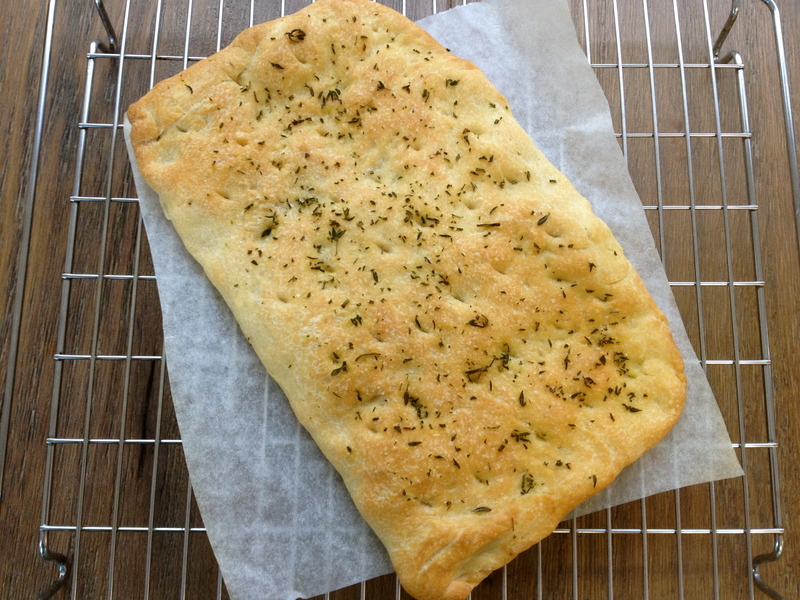 Your focaccia looks so wonderful! I had low expectations (but high hopes!) for this recipe myself, and mine came out nowhere near as good as yours did! Well done! Yum! I think I would have liked mine better if I made a topping like you did. Looks beautiful and sounds delicious! ooh, that onion one looks fantastic! I love your onion topping, sounds yummy!!! It gives me idea for the next time!!! Your adventurous bread looks delicious. I love all the extras you added on top! Delicious! I love your toppings! I also walk along while smacking on chunks of freshly baked bread. Sometimes I even do that in the office. Perfect looking crust. My mouth is watering….. Your focaccias look great too! Another fun post to read, Sanya. Love your tasty variations on the second batch. I will have to try your version for sure! Sounds wonderful and some of my favorite flavors!